A great alternative to pins, especially when working with heavy weight fabrics, piles, and vinyls. Wonder Clips can hold layered sections of sewing projects such as handle connectors to handbags and piping without distortion. It holds quilt binding while sewing and it is easy to see and easy to find when dropped on the floor. 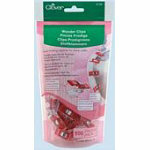 Clip base is flat for easy feeding to presser foot, and is marked with 14" 7mm and 12" 12mm seam allowance markings. Works well with Sergers 100ctpkg.